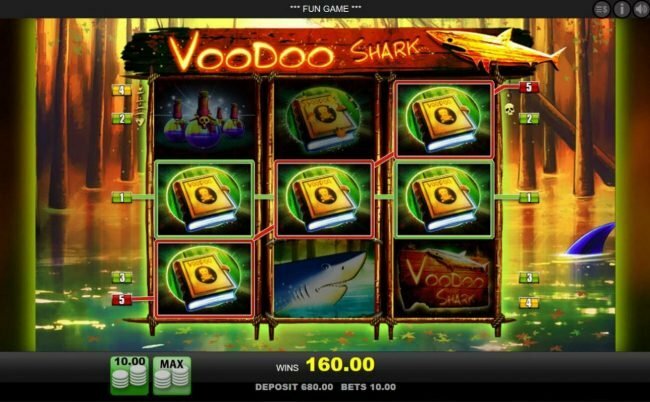 Voodoo Shark is a 3 reel slot machine with a top payout of $3,000 using the black magic occult theme. 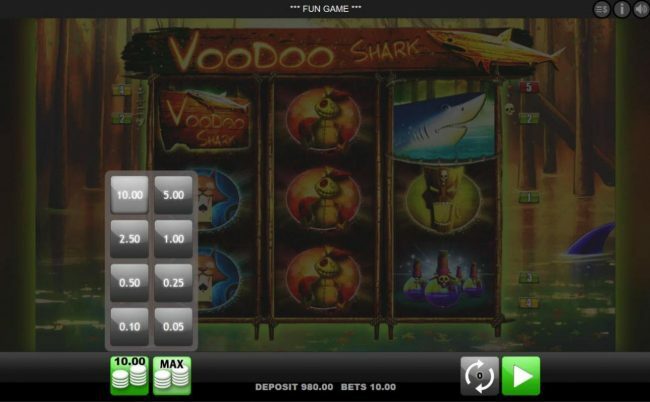 Voodoo Shark Slots has not been reviewed yet, be the first to rate this slot. 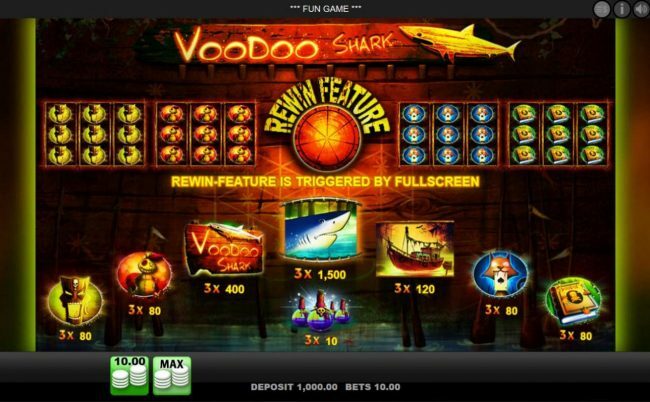 Voodoo Shark is a 5 reel, 3 payline Merkur Gaming classic slot that is themed around the voodoo of Central America. The only available Bonus feature of this slot is re-wins. Luckily, there is a top payout valued at $3,000.00. This is one of the most stunning Slots to be released from this developer. The graphics are modernized, allowing for the image to come out crisp and themes to be immersive. Behind the reels, there’s a swamp that has thousands of trees standing in its midst. The fin of a shark is also shown as it swims through the water. 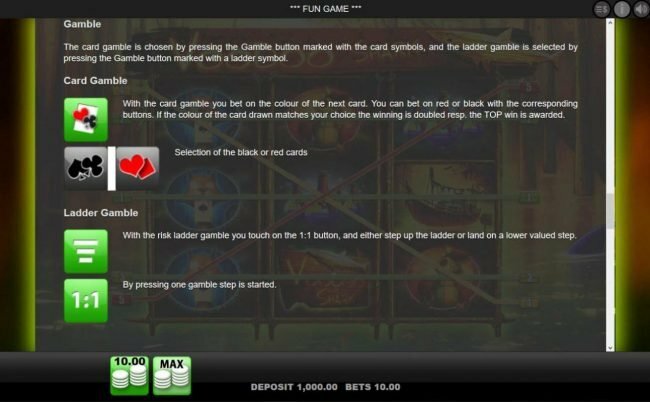 On the reel’s users will see a voodoo mask, voodoo doll, a game logo, a shark, old boats, a possessed cat and spell books as Slot symbols. These icons only further the themes haunting essence. 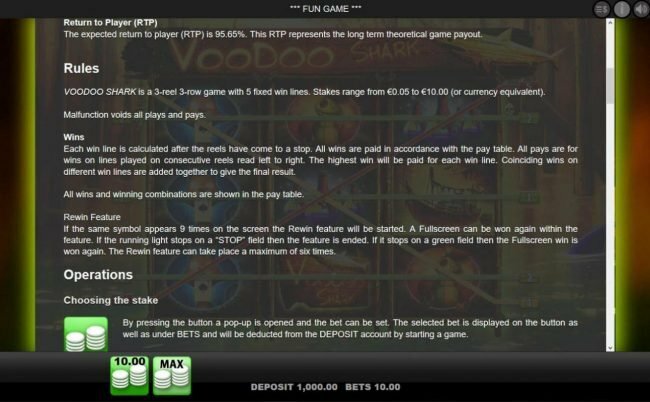 Two options are provided in the betting selection of Voodoo Shark. These relate to the amount per spin that, with that ranging from $0.01 and $10.00. Once chosen, spin the reels to begin gameplay. The re-win feature is awarded only when there’s a full screen off the voodoo masks, voodoo dolls, possessed cats or spell books. 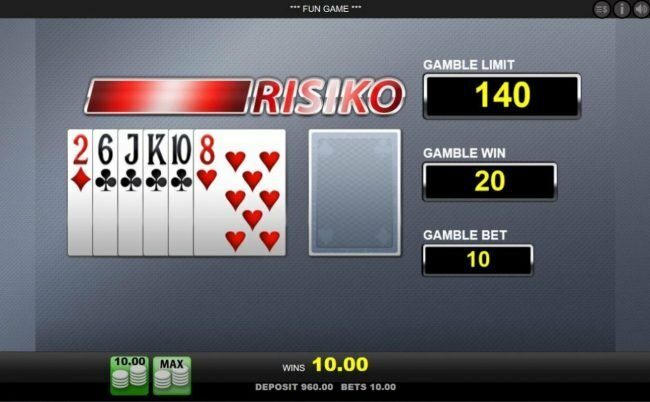 The re-win has the reels re-spun in hopes of initiating a new payout prize. Unfortunately, this is the only feature available in this game. 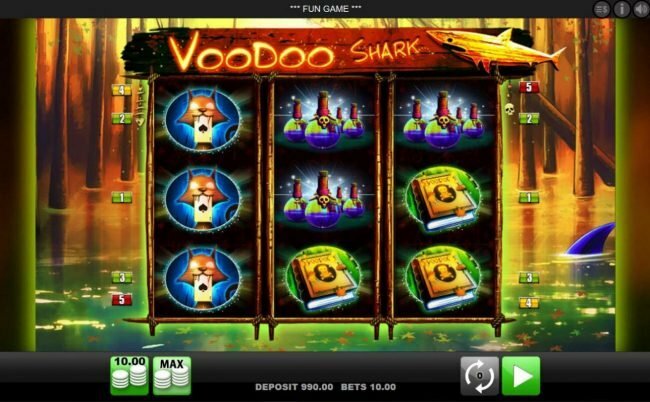 Voodoo Shark, it’s one of the most visually impressive games to be released by Merkur Gaming. Where it lacks is in its gameplay which feels outdated and insufficient to today's standards. For some, the theme might be enough but for others, it won’t. So, overall, this game could have been better but still is worth giving a try.